Capturing the zeitgeist of modern rebellion in the last ever body-on-frame American sedan. It’s a Thursday afternoon in the sunny Okanagan valley, and I’m stuck waiting for a gap in traffic. Not fifteen seconds after I crank up Four Year Strong’s eponymous 2015 album, the right lane clears. I roll onto it, and the rowdy thunder from the side-exit rips through the air and ricochets off of the surrounding buildings. If a Fleetwood is Hemingway’s The Old Man And The Sea, this is Thompson’s Fear and Loathing in Las Vegas. Self-destructive, lurid, and fed up with the way the world is. The traditional, body-on frame, full-size American sedan has been dead for almost five years, and people are still mourning. Look at the various message boards and blog posts online, and a lot of people still miss the Crown Victoria, Grand Marquis, and Town Car. I can see why, as they’re tough, comfortable, and safe. Good cars if you don’t care about efficiency or packaging, but bad cars if you don’t want to look either retired or like a wannabe tough-guy. Mr. Regular was right, inasmuch as most people buy P71s for the image. 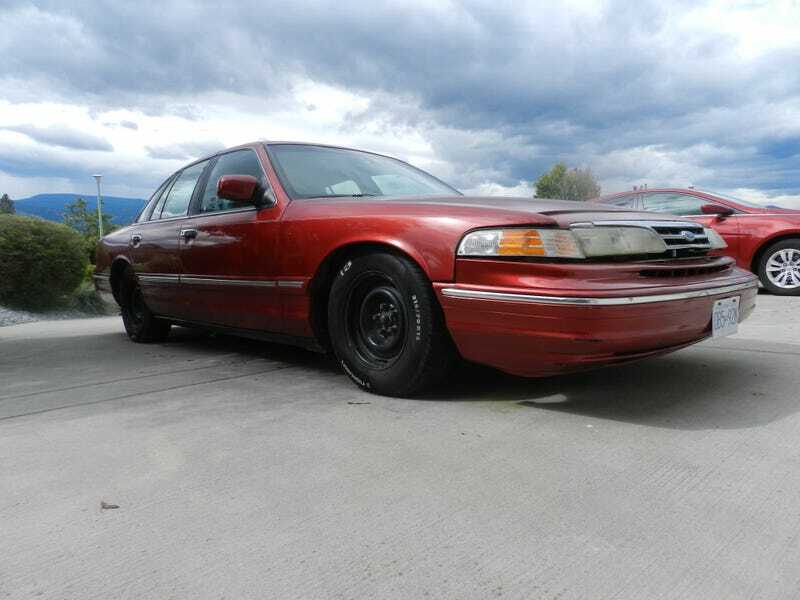 But this is a P73, which has none of the performance enhancements of the P71, so it’s not really that good of a car. What possessed me to buy one? Eight cylinders, 4.6 liters, and rear wheel drive. Gas is only going to get more expensive, so you might as well enjoy these cars while you can. After all, when they make that kind of soundtrack uncorked, drive that smooth and are that cheap, why not go for it? Of course, if anyone’s been reading my blog for a while, they’ll know that I rarely ever leave things stock. So I threw in a new stereo, and that was great. But then I wanted it to look and handle better, so I put in a used set of springs (metric body circle track fronts, SN95 lowering rears), and bolted on used Bilsteins. While I was at it, I got a set of Nokian i3s mounted and balanced, pulled the hubcaps, and did the sidewall lettering in white. So now it looked fantastic, and had a banging system, but that wasn’t enough. It needed something more. Seeing as my exhaust was rubbing on my axle over hard bumps and developing a blow, I sliced off a good chunk of it, and installed a used bullet muffler and some side-exit piping. Now that’s more like it. How does it drive? Well, acceleration is actually quite satisfactory, as you surge forwards on a wave of torque. Never mind that it makes the same horsepower as a 2014 Hyundai Sonata, it has more torque and thus never feels especially underpowered. The steering is very light and slow, but there’s enough feedback to make it not feel like an arcade steering wheel. Throttle response is linear and direct with minimal hesitation, although the transmission really does take it’s time to kick down a gear or two. On the new suspension, particularly over the William R Bennett bridge, it rides like a bounce house bought off of AliExpress. However, cornering is fantastic. Turn-in is noticeably quicker, you have a ton of mechanical grip, and can set it up to be quite neutral. Of course, inflate the rear tires enough and it will slide about like a Corgi on a hardwood floor, but that’s to be expected. The creature comforts are rather nice. The seats are very comfortable, the heater is fantastic, the dual sunvisors are quite nice, and when I had them in, the stock speakers sounded pretty decent. But the sound now is by far and above the best thing about it. Since I have put the new exhaust on it, I’ve discovered a surprising and delightful range of intoxicating noises. At idle, it’s throaty. Cruising about a low speeds, it’s gruff and satisfying, like an old high-compression 302. When you roll onto it a little, it gives off a smooth mechanical roar, and when you really have to put your foot down, it produces a maniacal, deranged cackle that’s guaranteed to put a grin on the driver’s face. Of course, it does the usual fireworks crackle when you let off, but that’s to be expected. Sure, you can get that power out of an inline four, but you’ll never get that noise out of it. It’s exciting and antisocial and thunderous and everything. This car is now seen as everything wrong with cars. It’s too big, too heavy, too inefficient, to wayward, too loud, too antiquated, and stands out too much. It will take forever for these things to appreciate and be seen as more than just a lump of something, and that has a certain resonance with the youth of today. Perpetually stymied by the surrounding world, this generation and the Crown Victoria are both fed up. And they want to make some noise. Because sometimes you’re not willing to settle. Sometimes a sledgehammer is too subtle for your application. Sometimes you want to let it rip, and this outmoded behemoth will be alongside you every step of the way. Thomas Hundal is a self-professed car guy living in British Columbia. He posts occasionally on his personal blog and has a habit of ruining cheap cars.